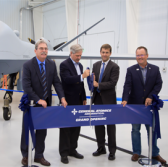 General Atomics‘ aeronautical systems business hosted a ribbon-cutting ceremony Monday to mark the opening of a new unmanned aircraft system hangar at the Grand Sky business park in North Dakota. The company said Tuesday its Flight Test and Training Center hangar is built to house GA-ASI operational hardware such as MQ-1 Predator and MQ-9 Predator B remotely piloted aircraft and ground control stations. FTTC hangar also features conference rooms and offices and replaces a temporary facility the company has used since June last year. David Alexander, president of aircraft systems at GA-ASI, said the company aims to help customers train aircrews on how to fly RPAs through the facility. GA-ASI also operates an office building near the University of North Dakota campus and the facility is equipped with a Predator Mission Aircrew Training System to aid academic and simulator training programs.